Leading American manufacturer of commercial and consumer metal products, Glaro, Incorporated, releases the new Value Line of RecyclePro Recycling Receptacles as the latest economical solution for providing a recycling station! Value RecyclePro Recycling Receptacles by Glaro Inc.
Glaro’s recycling receptacles and recycling containers offer the versatility, mix and match options, and customization options that the market demands today. Glaro’s new line of “Value Recycling Containers” offers the most economical solution when providing a recycling station for visitors. Additional inner metal liner cans are optional in Glaro’s Value line of receptacles. Heavy duty poly bags are used instead. It is the most versatile line because a multitude of openings in the covers are available, there is a large selection of finishes to choose from, and units are available in half round and round designs. As with all Glaro recycling receptacles, customers may select from a variety of messages that are silk screened onto each unit instead of applied decals. Custom messages and logos are easily available as well. 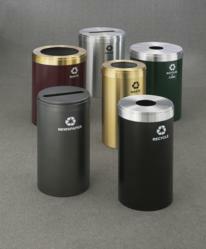 All Glaro metal recycling receptacles, called RecyclePro, are produced using recycled metals and packing materials. All units are post consumer recyclable. The recycling receptacles are available in 31 attractive finishes including 29 baked powder coated finishes and two metal finishes of satin aluminum and tarnish-proof satin brass. Powder coated units are made of steel. The top covers may be one finish and the body may be another at the discretion of the designer or customer, so that a chosen “look” may be achieved. These colors may be matched to other Glaro lines resulting in “continuity of design” throughout a facility. Designers agree that these matching and finish options enable the product to “look visually appealing in the context of the design and palette of the designated spaces”. All Glaro products, including the RecyclePro Value Line of recycling receptacles, are carefully crafted at the Glaro plant in the USA. Products manufactured by Glaro are the favorite choice for use in hotels, restaurants, buildings of all types, educational facilities, hospitals, etc. As with all Glaro merchandise the RecyclePro Value Line of Recycling Receptacles can be shipped within a few days from receipt of orders. Full details of all of these new products can be reviewed and downloaded on the Glaro Inc. website (glaro.com). About Glaro: Glaro, Inc. (glaro.com) is a leading USA manufacturer of commercial and consumer aluminum products sold through dealers for over 65 years. All products ship in 1 to 3 days. Glaro products are the result of a focus on thoughtful innovation and design. Product lines include bellman carts, waste receptacles, recycling receptacles, smokers’ posts, crowd control posts, sign frames, and directories, coat hanging equipment, umbrella stands, planters, and key drop boxes. A diverse selection of models in 31 finishes is produced in the Hauppauge, New York plant by skilled Glaro craftsmen. The company is known for its quality merchandise and its ability to consistently quick ship all products. The customer service department provides unusually prompt personal service and is sensitive to the needs of dealers.